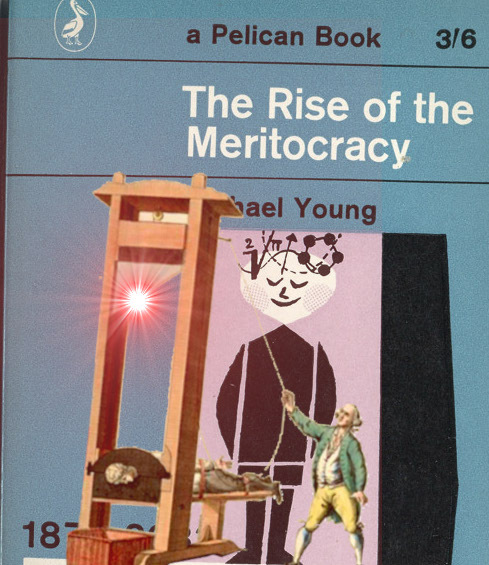 The term "meritocracy" was popularized in the UK sociologist Michael Young's 1958 novel, "The Rise of the Meritocracy," in which aristocrats insist that they are the natural rulers of their society based on "objective" measures of worth ("merit" + "aristocracy" = "meritocracy") that are obviously tilted to favor them, a fact that they are conveniently blind to. But satire has a way of being overtaken by doctrine, and today, a majority of Americans believe that they live in a meritocracy where the market elevates the worthy to positions of wealth and privilege (and power!) despite widespread evidence that the rich cheat. Even as inequality has worsened, the 9.9% have only become more convinced that merit is the factor that determines success, freaking out when you point out the role that luck paid in their elevation, and despite the extensive literature showing that meritocracies become oligarchies in short order. Today, the belief in "meritocracy" has become a hallmark of violent, right-wing harassment and terror movements, whose doctrinal conviction that they live in a meritocracy is also a convenient reason to deny calls for inclusiveness ("If women are so smart, how come they're paid less than men?!"). The meritocratic delusion finally seems to be in decline. Behavior economists are producing reams of research showing that people who believe in meritocracy make decisions that harm them, while management scholars are producing research that shows that "meritocratic" evaluation criteria causes managers to downrank women who fare as well as men when the idea of meritocracy is taken off the table. Of course, meritocracy is a delusion with an extremely profitable business model. A widespread belief in meritocracy saves the super-rich untold sums in guard-labor to prevent mobs from building guillotines in their circular driveways. So long as the oligarch class continues to promote the circular logic of meritocracy -- "The best people find their way to the top, and I should know, I'm the best person I know and I'm on top. How do I know I'm the best? Well, I'm on top, aren't I?" -- its final days will be forestalled.